Because of him, this is illegal now. A new law will make it illegal for hunters in Alberta, Canada, to take down animals with spears. In case you're wondering why a law like that would even be necessary, look no further than this guy. 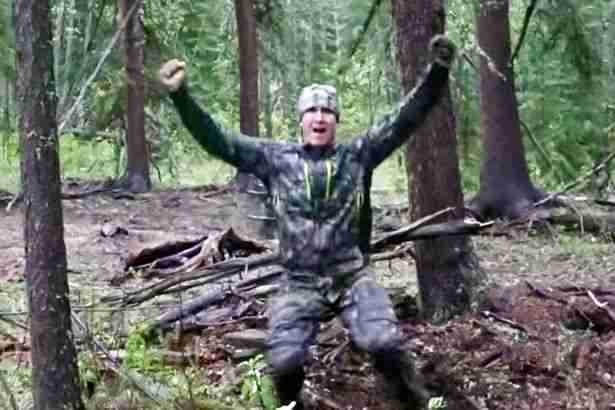 Josh Bowmar, an Ohio fitness company owner, faces a hail of criticism, after his made-for-TV hunt of a black bear went viral for all the wrong reasons. 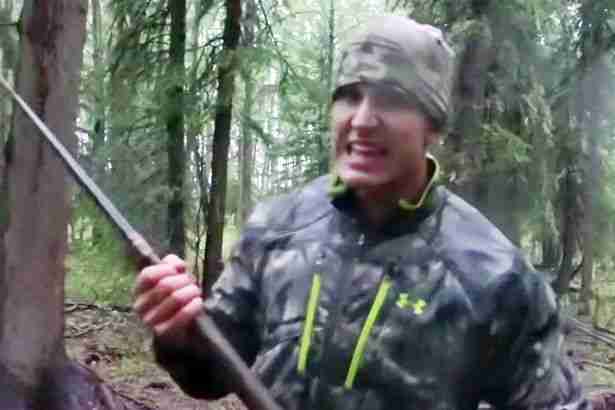 The video of him methodically drawing in the bear with baited barrels, before hurling a spear at the animal, was posted on YouTube in early June. Bowmar doesn't return to collect the corpse until the next morning, suggesting the bear may have lain dying throughout the night. 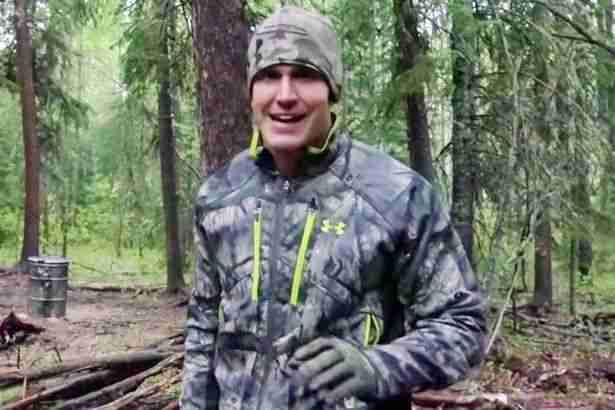 When the hunter finally returns, he's joined by John and Jenn Rivet, owners of a reality-show-style hunting business. Bowmar, reportedly a championship javelin thrower back in college, crowed about the kill in the 13-minute video. "He's going down," he says. "I drilled him perfect. That was the longest throw I thought I could ever make ... I just did something I don't think anybody in the entire world has ever done and that was spear a bear on the ground on film. And I smoked him." Later, Bowmar adds, "That's going to be some epic footage. I got mad penetration." The original video has since been deleted - but not before drawing 200,000 views, along with a torrent of criticism. In a second posting of the video, hunters and non-hunters alike condemn the act, with many in the comment section calling it "savage". One viewer likened it to "javelin practice on a bear." The kill also sparked the ire of provincial lawmakers. It's currently legal to hunt black bears in Alberta - as well as neighboring British Columbia. In the U.S., spear hunting is only legal in Alabama. But after the grisly incident in Alberta, its government is scrambling to take crude implements like spears out of the equation. "Work is well under way to update Alberta's hunting regulations," Alberta Environment and Parks spokesman Tim Chamberlin told the Globe and Mail. "We will introduce a ban on spear hunting this fall as part of those updated regulations ... In the meantime, we have asked Fish and Wildlife officers to investigate this incident to determine if charges are warranted under existing laws." But Bowmar is standing firm in the face of criticism. Earlier this week, he told the The Mirror his critics have no respect for ancient history. "You all should be ashamed of yourselves for trying to kill a heritage that has existed for over a million years," he said. "Literally, since the dawn of man, the spear has been a vital role in survival. If (I) didn't care about the humane killing of this bear, why did I spend years preparing and practicing, becoming extremely proficient with a spear to make sure I could harvest this bear ethically?" If this video is a modern-day tribute to a dawn-of-man hunting technique, we might as well fast-forward to the twilight of humanity. Or, of course, we could all get behind movements that would modernize hunting laws everywhere - and drag people like Bowmar, kicking and screaming, out of the Stone Age. Or ban them altogether. This is why the idea that killing hunting helps conservation is wrong. You can sign petitions to stop bear hunts where they happen - from Alabama to British Columbia, Canada.